Photos of an elderly man, who earns 10,000 RMB (roughly US$1,600 or Php69,000) monthly by just begging, are going viral on social media. Citing a story on The Beijing News, Shanghaiist.com reports that the unidentified man, believed to be about 70 years old, begs for money in the capital city of China. It is his only source of income, but he makes up to 20,000 RMB during the holidays. After the Chinese mid-autumn harvest festival, he reportedly came to the post office in three consecutive days as he cannot count all of his money in one day. 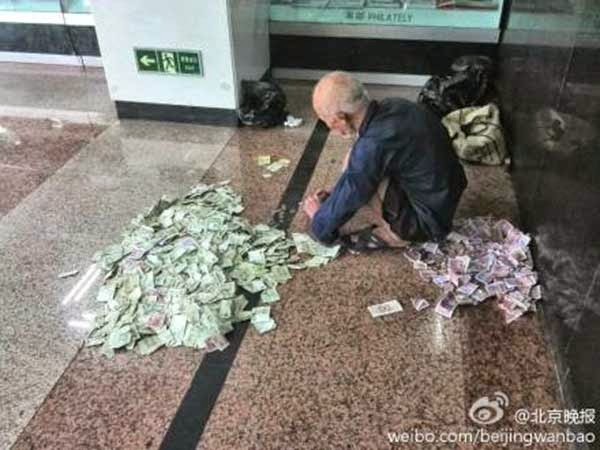 According to Shanghaiist.com, he counts the money on the floor then hands it over to the counter for remittance to his loved ones in his hometown. The old man remits the money to his family living in the Jiangsu province, where he built a two-storey house. He is also able to send 3 students to a university, says the report. The beggar, who is considered by post office personnel as "one of their biggest customers," gives tips to staff members who help him count his money.